TemplateHack.com - Download Jupiter premium blogger template. Jupiter is magazine design made with elegant design. Jupiter made with side show section to place your favorite post or editor pick. Also, this template has ads section to place your ads easily without coding. Jupiter is one of the best magazine blogger com templates. It has a unique and elegant design. Look at the top of page, bottom of social bookmark and navigation menu, there are search button in the middle with triangle shape. A unique design to make this template different than other magazine template. Ads Ready, Breadcrumbs, Browser Compatibility, Drop Down Menu, Email Subscription Widget Ready, Featured Post, Grid, HTML5 Valid, Mobile Friendly, Page Navigation Menu, Post Thumbnails, Social Bookmark Ready, Social Share Button, Whatsapp Sharing Button, Whatsapp Sharing Button, Elegant, Minimalist, 2 Right Sidebar, Black, Blue, Orange, 2 Columns, 3 Columns Footer. 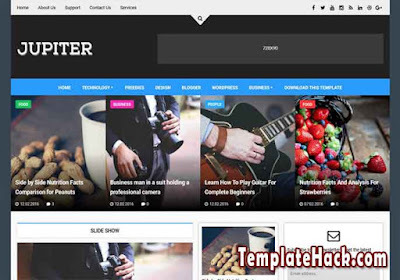 Entertainment blogger template, Gadget blogger template, Games blogger template, Gallery blogger template, Lifestyle blogger template, Magazine blogger template, Mansory blogger template, Portal blogger template, Reviews blogger template, Sports blogger template, Tech blogger template, Technology blogger template, Viral blogger template.